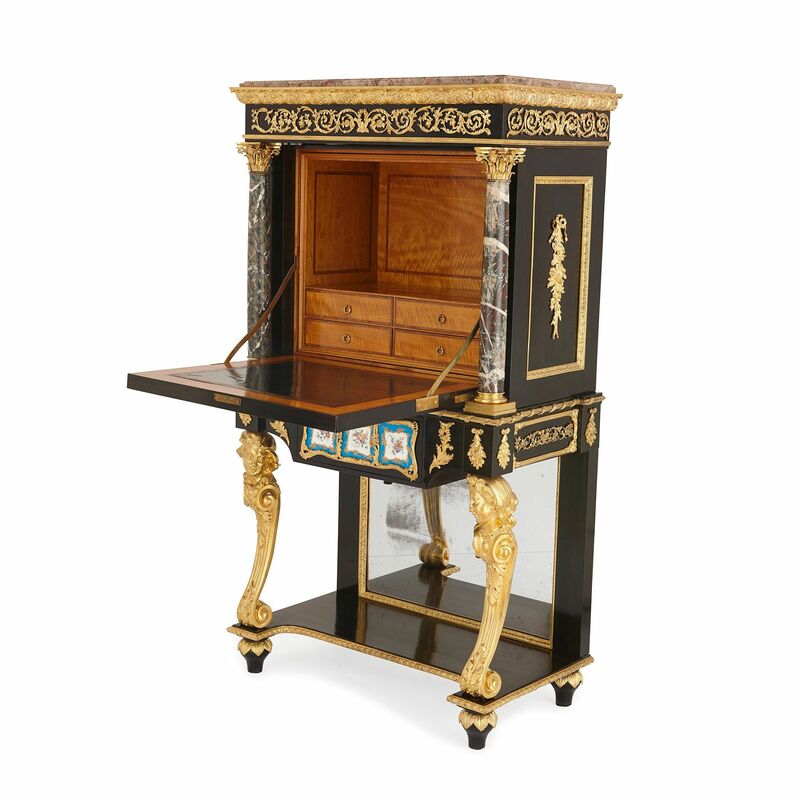 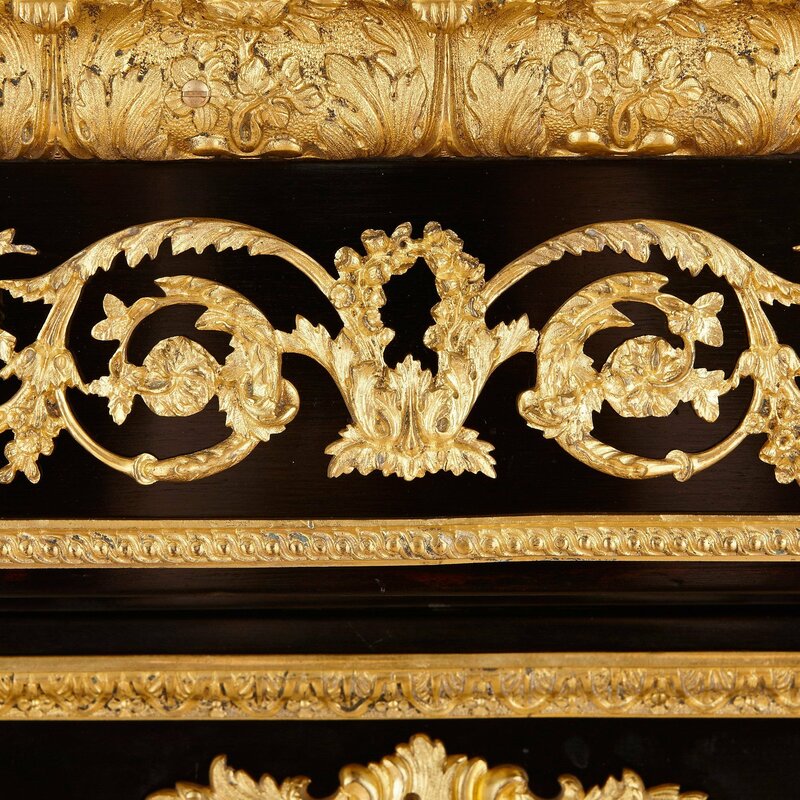 These exquisite secretaires exemplify the skill with which preeminent 19th century English cabinetmakers worked in the style of the French Ancien Régime. 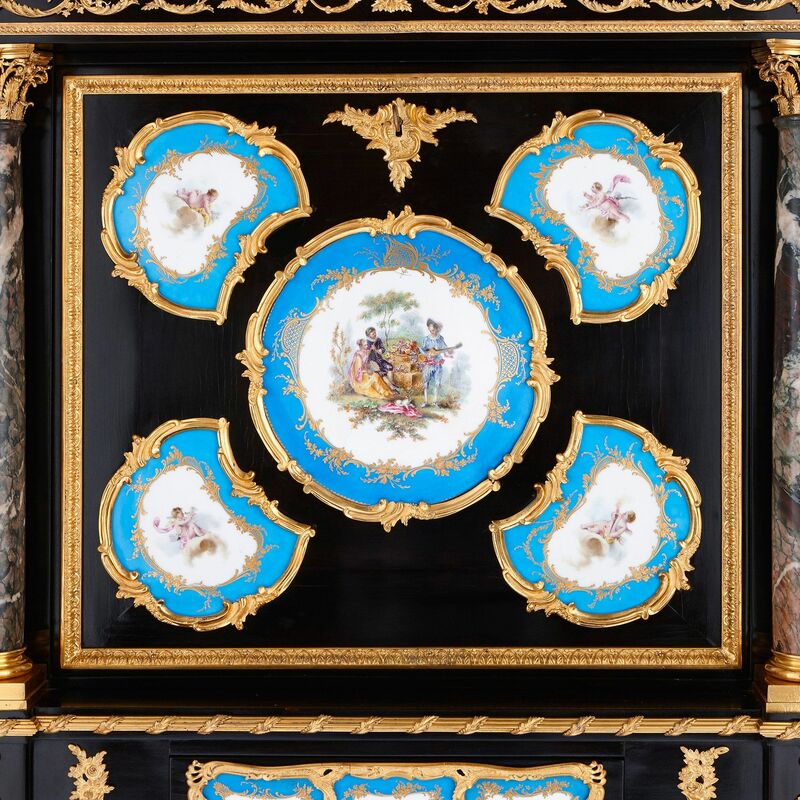 Each with rectangular brocatelle marble top over a conforming scrolled foliate frieze, above a central fall-front set with gilt-decorated porcelain plaques painted with fêtes gallantes, the interior fitted with a pigeon hole and four short drawers, flanked by a pair of Campan Rubanémarble columns, above a shaped apron set with a spring-activated drawer, on scrolled male and female term supports joined by an ormolu-molded undertier and mirrored backsplash. 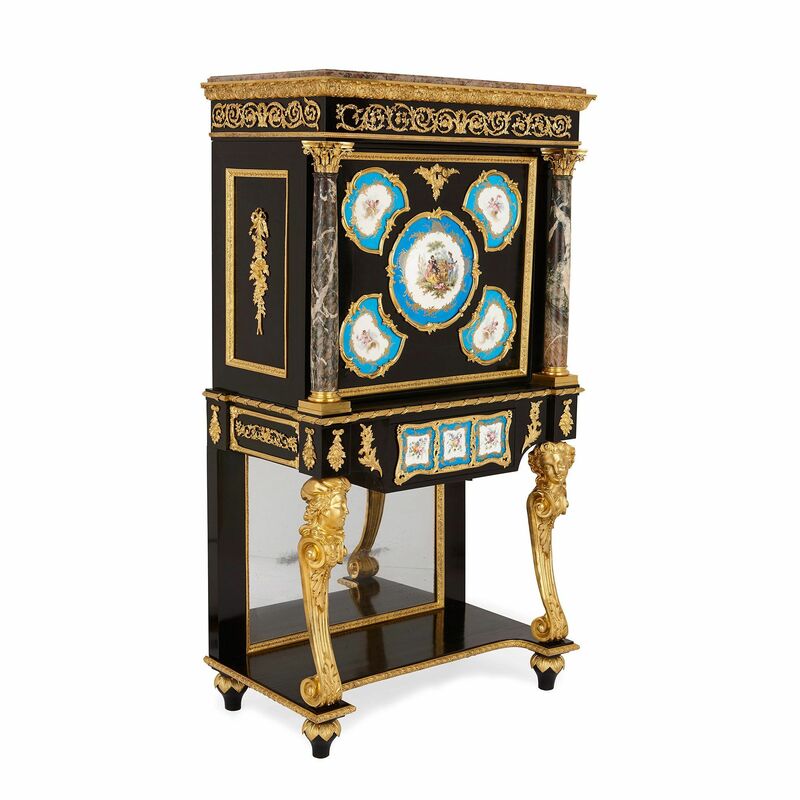 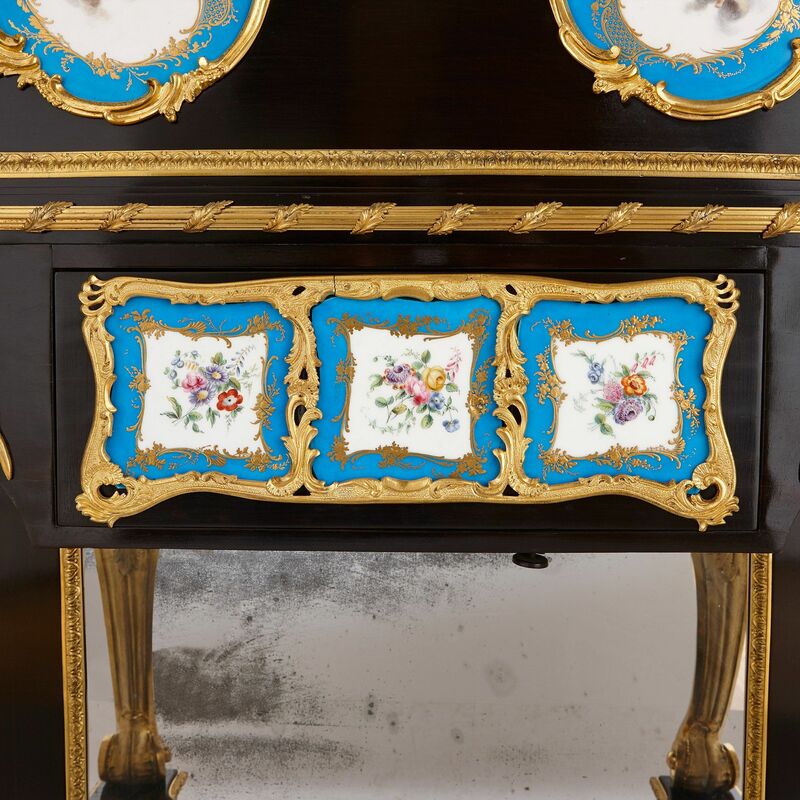 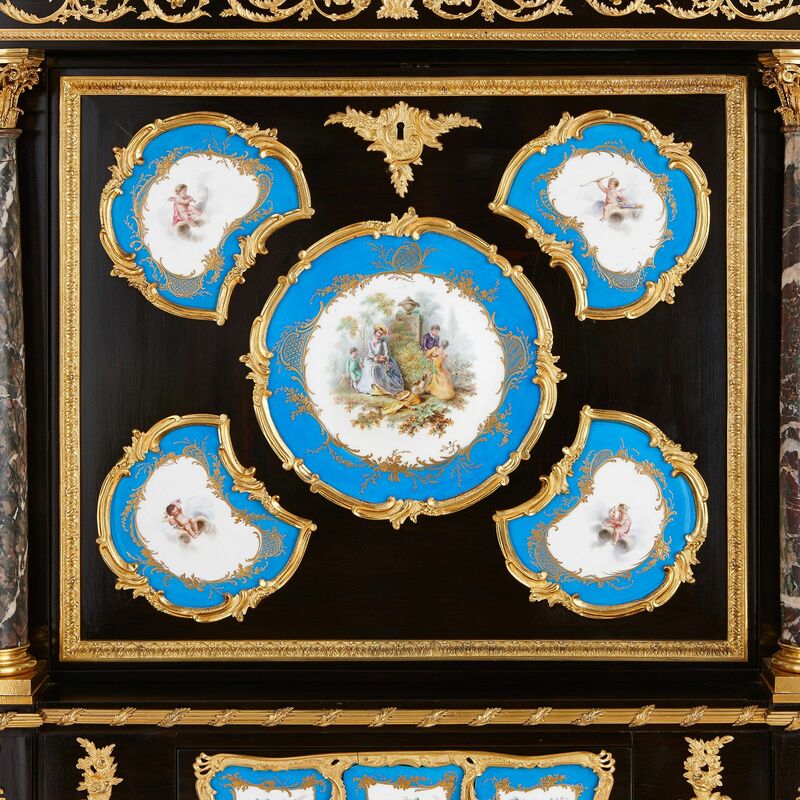 Combining high-style French elements (Sèvres style plaques and the coat-of-arms of the Le Tellier family) and top English construction (fine dovetailing and quarter-molding to the interior of the frieze drawers), the cabinets reflect a taste championed by only a small number of reputable English firms. 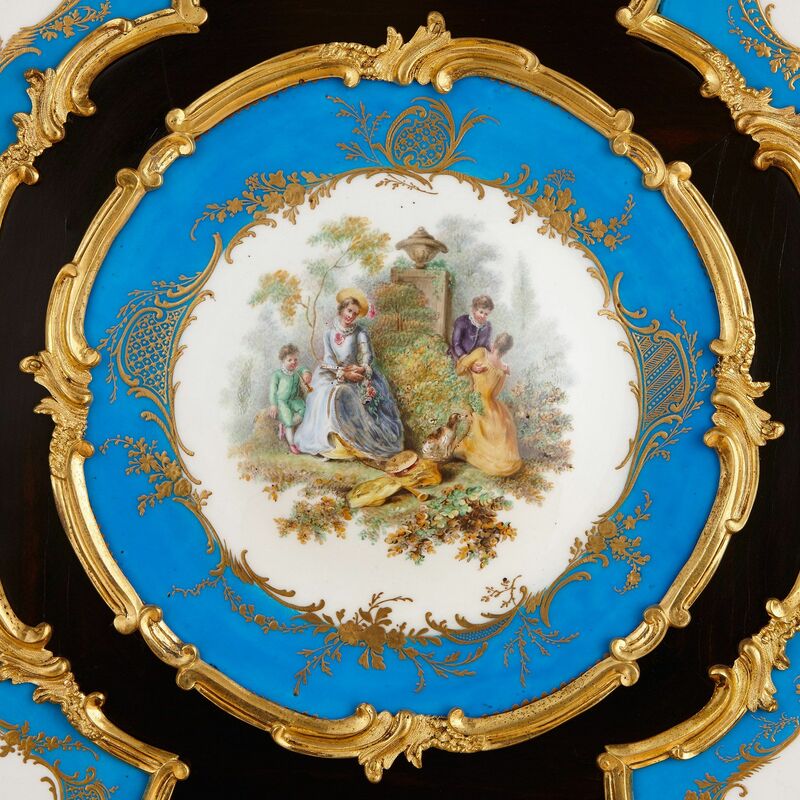 Notable makers such as Edward Holmes Baldock and Blake of London, both active in the 1840s and 1850s, repeatedly exhibited pieces in the French style. 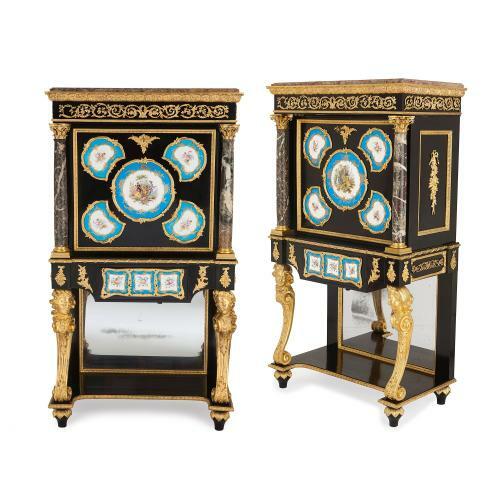 A porcelain-mounted and ebony veneered secrétaire by Blake and a pair of porcelain and rosewood meubles d'appui by Baldock offered at Sotheby's, London, 28 October 2009, lot 77 and Sotheby's, New York, 19 April 2007, lot 123, respectively. 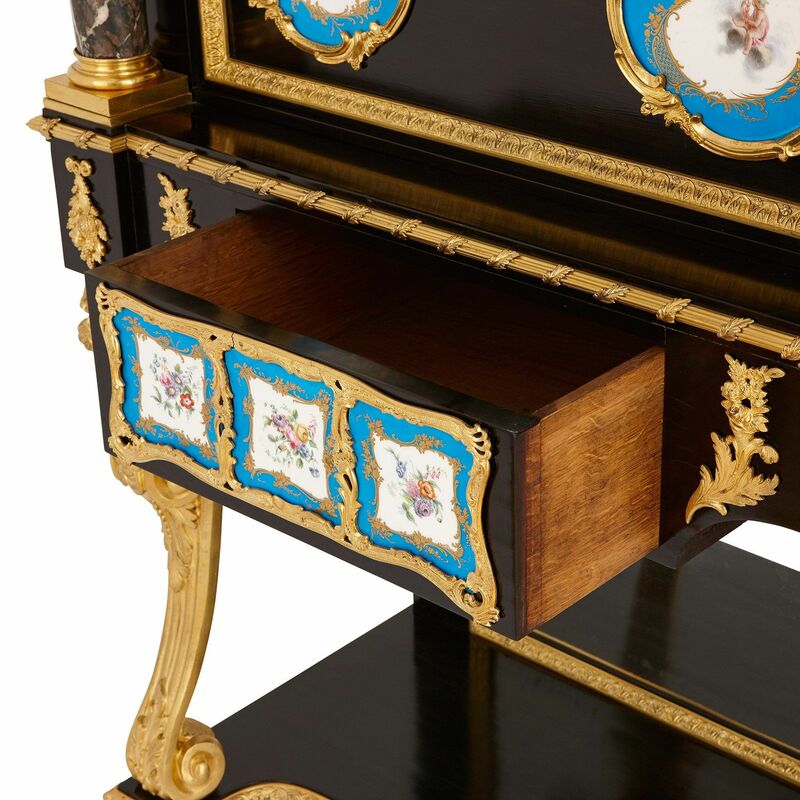 The work of both firms embody the very fashionable taste of the period for high quality furnishing of nearly a century earlier. 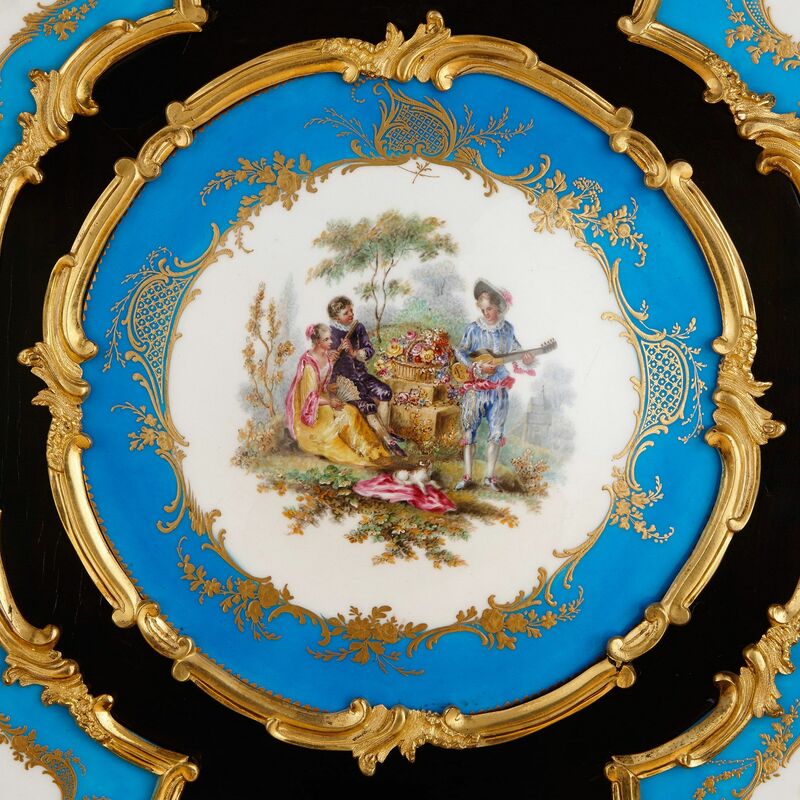 From the Estate of Margaret B. Nichols.